At the recent Wine Bloggers Conference in Santa Barbara I had the privilege of attending a Syrah tasting that introduced the wines of the recently approved Ballard Canyon AVA to the blogger community. I feel like a kid in a candy store at these kinds of events. 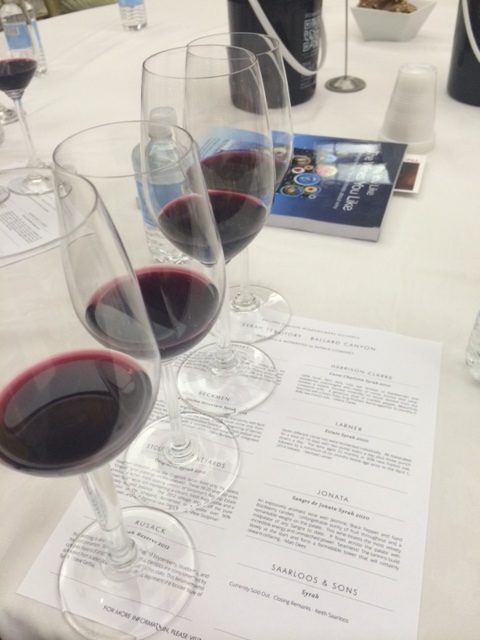 It’s rare that Syrah gets its own seminar and, much like last year’s Syrah event at the West of West tasting in Sebastopol, I couldn’t have been more thrilled. Patrick Comiskey moderated the event. Patrick is writing a book on Rhone varieties in America and I’ve been wanting to meet him for a long time. His opening remarks were a reprise of his recent talk at the Syrah conference up in Walla Walla. He’s an expert on Syrah, and, in general, his ideas about what is going on with Syrah are right on. You can find the full text of his Walla Walla talk here. To summarize, Patrick blames the declining state of Syrah in America on the fact that it has been planted in areas that haven’t embraced its inherent wildness. When Syrah isn’t wild it simply isn’t good. It’s dull, jammy fruit and oak, and rather non-descript. To me, Syrah expresses its wildness best in cool climates. In recent years I’ve had some good examples of “wild” Syrah planted in warmer climates but, in general, I still say that Syrah does best with cooler climate influences that accentuate its wild, savory side. And that brings us to Ballard Canyon. The recently approved AVA is one that will be mostly dedicated to Syrah. Peter Stolpman, as the elected head of Ballard Canyon, represents an unparalleled collective of Syrah-based wineries. While not an extreme cool-climate site by any means, its area, like many parts of Santa Barbara County, has a lot of maritime influence. Comiskey has called it, “a warm spot in a cool place.” According to geology buff Michael Larner, of Ballard Canyon’s Larner Wines, the soils of the area are mostly sand. The sand has the effect of stressing the vines which leads to an intensity of fruit. Beneath the sand lies a chalky limestone soil that lends complexity and interest. This combination of soil influences, along with windy maritime afternoons which keep temperatures from rising too high, makes for a Syrah of power and elegance. The following are my notes from a tasting of six wines that the Ballard collective chose to represent the new AVA. Forgive my lack of detail for some of the wines; I was so blissed out by all the talk of Syrah that I didn’t take the greatest notes. Hopefully, they will give a sense of the uniqueness of Ballard Canyon. The first three wines poured and waiting. This is a new project, not yet released, from long-time vineyard manager for the area, Ruben Solorzano. The wine had some cool-climate character but verged a little too much into the warmer style. Good energy on the mid-plate though, with a nice bitter chocolate finish. As in all of these wines, a good combination of concentration and energy. Beckman is a name that’s synonymous with Syrah in Santa Barbara county. Their Ballard Canyon Syrah is 2012 La Purisima Mountain Syrah. I have found most of their Syrah bottlings to be a little too ripe and too big for me and the La Purisima was no exception but it did have good energy and acidity. Steve Beckman referred to the wine as a combination of cool and warm climates and I think that’s a fair description. It had some cool-climate character but embraces warm climate while maintaining the structure and acidity of a cool-climate wine. The 2012 Stolpman Originals Syrah ranged a tad more into the cool-climate style than the previous two. It had beautiful fruit but also this untamed, meaty element that revealed its true Syrah character. A great wine to represent Ballard Canyon. The 2012 Rusack Reserve Syrah was a nice wine and many of the people at the tasting liked it but for me it simply had too much new oak. I got some chocolate aromas and it did have that characteristic of concentration and acidity. The 2010 Cuvee Charlotte Syrah was a bigger wine but maintained some good acidity. These wines all have a complexity and acidity behind the big fruit but this was a tad too big. The 2010 Larner Estate Syrah was too big for me, also. A warmer and somewhat extracted style for sure. Again the characteristic of concentration and ripeness was there. The 2010 Sangre de Jonata Syrah was my favorite of the bunch and, unfortunately, at $125 is probably a wine I’ll never purchase. It had the most elegance of the bunch and had a bit of green character that I like. Most of the people I talked to disliked it because it had that leafy character. I appreciated its lift, purity, and elegance. Overall, Ballard Canyon impressed me with the concentration and energy on the mid palate, though I would like to see that dialed back a bit, possibly by picking the grapes earlier. These are great iterations of Syrah and will do well in the marketplace. They’re a wonderful ambassador for Syrah because of that unique combination of warm and cool climates. I look forward to seeing how this AVA develops. It’s a step in the right direction for planting Syrah firmly back into the landscape of California wine. 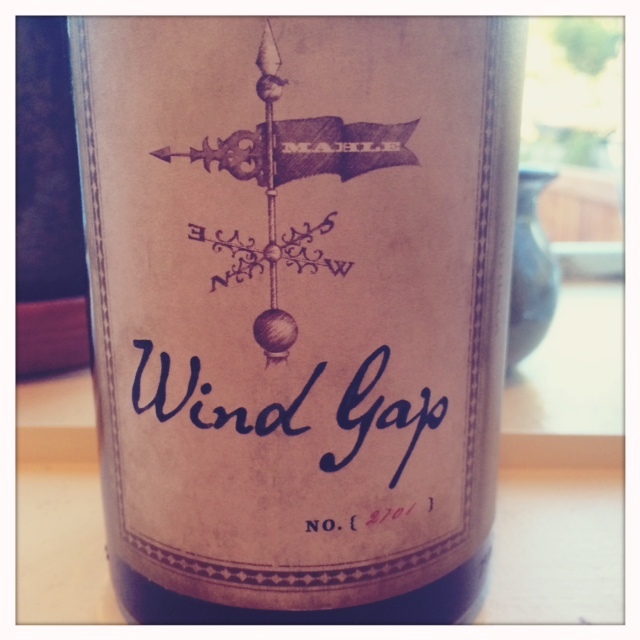 At the Wind Gap tasting room in Sebastopol I tasted the 2012 Nellessen Syrah. I love this Syrah. At the time I thought it was the best Syrah I’ve had so far from the 2012 vintage. I bought a bottle to taste at home over a couple of days. It more than lived up to my first impression. This is a decidedly cool-climate Syrah, it’s almost as if Pax Mahle made a carbon copy of a savory Northern Rhone Syrah. It’s got that tobacco, pepper and bright plum thing going on big time, there’s a green element reminiscent of celery and it’s all couched in fresh plum and blackberry fruit. All of that carries over to the mid-palate which has great acidity and juicy freshness. The tannins are present but the wine doesn’t completely dry out the palate. A great wine with food but also very drinkable on its own. The most striking thing is how little oak influences the wine and how little it tastes “Californian”. I know California is known for ripe fruit and it’s not as if we shouldn’t embrace that part of this great wine-growing state but I think there’s a place for cool-climate Syrah here and this is one of those. I put it into the group of the Peay La Bruma, Failla Estate, the Arnot Roberts Clary Ranch, the various Ant Hill Syrahs, MacLaren Wines Judge Family Vineyard, and the recent Red Car vintages for being a textbook examples of cool-climate Syrah. On day two the wine is a little more open and some of that savoriness has given way to rich plum, although the celery and pepper is still right there in the background. The mid-palate is softer and fuller and the finish a tad less tannic and reminiscent of fresh blackberry. This is a wine that I think will age beautifully and I wish I’d bought a few bottles to put down. Pax doesn’t often make wines from the Nellessen Vineyard that end up with their own bottling, the grapes are usually mixed in with others and added to his Wind Gap Syrah but I’m guessing that in the abundant 2012 vintage the fruit was begging for its own vineyard designation. It’s such a pleasure to drink a wine that is so true to the Syrah’s motherland in the Northern Rhone and it’s further proof that California’s diverse climate is a proper home to all of Syrah’s diverse permutations.